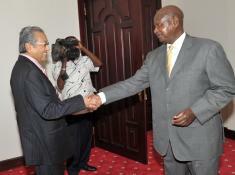 President Yoweri Museveni has said that the main cause of insecurity in Africa is the problem of interests versus identity. The President made these observations today during a meeting at State House Entebbe where he received the French Ambassador to Uganda, Ms. Stephanie Rivoal. President Yoweri Museveni has held discussions with Chinese Oil Company (CNOOC) International officials who were led by the Company’s Executive Vice-President, Mr. Li Yong. 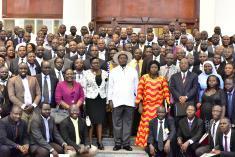 The meeting took place at State House Entebbe. President Yoweri Museveni has re-emphasized his call to the people of districts in West Nile Sub-Region to fully embrace the modernization and commercialization of agriculture in the districts of West Nile Region with the aim of increasing the area’s productivity so as to address the challenge of household incomes. President Yoweri Museveni has saluted the late Sospeter Bamulangeyo Kaisa whose business acumen took a vertical integration in farming through combining animal farming, processing and crop farming in Namusambya village Kitayungwa Sub-County of Kamuli district in Busoga Sub-Region. President Yoweri Museveni has said that this term of government and the NRM must be that of action and not endless talk and depending on civil servants. He added that he expects the new ministers to be leaders of a new type who interact with civil servants to be knowledgeable to avoid being misled. President YoweriMuseveni has appealed to the people of Uganda not to mix politics with emotions as politics is purely scientific. President Yoweri Museveni has mourned veteran politician, Tiberio Okeny Atwoma, describing him as a freedom fighter and a nationalist who stood by the truth. He noted that the late Okeny Atwoma who cherished and spoke the truth was indeed a freedom fighter and a nationalist as he relentlessly fought for the unity of the people of Uganda.